Kernie Cam Productions: News: The Dog Dish Celebrates the Holidays in Style! The Dog Dish Celebrates the Holidays in Style! Northern Lehigh High School's The Dog Dish morning show launched its second successful season with a new animated title sequence and special intros for the Halloween and Holiday festivities. Featuring new crew members in addition to several returning faces, the standard show opening utilized chroma key and 3D layer components of Adobe After Effects to create a high-energy start to the live daily broadcasts. An extra jolt of pep was provided through the use of Imagine Dragon's hit single, "On Top of the World." 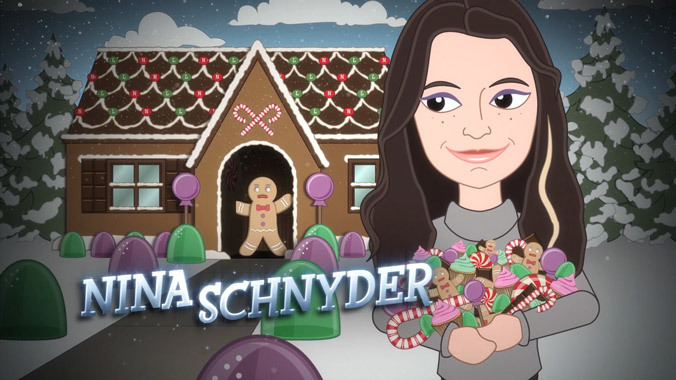 Continuing a tradition from Season 1, The Dog Dish ushered in the Halloween and Winter celebrations with special opening title sequences, featuring each crew member in a custom holiday-themed graphic. Using a cover of Oingo Boingo's "Dead Man's Party" by punk band A Thorn For Every Heart, the Halloween intro sported green-screen footage of each student in an animated 3D environment. Of particular interest is the use of computer-generated crows and cornstalks in Thomas Quigley's scarecrow sequence and fire compositing and particle animation for the mummified John "Skippy" Taylor segment. Animations for Nate Czarnecki, Kelcie Kramer, Marissa Marsh, Nina Schnyder, and Tyler Trumbauer were recycled, revamped, and repurposed from the 2012 version, while new graphics were designed for incoming members Zach Joy, Thomas Quigley, John Taylor, and Kasey Wayda. Additional foley and sound effects were added to enhance the finished product. For the winter Holiday season, Kernie Cam Productions once again produced a custom-animated opening title sequence for The Dog Dish. Instead of using green screen footage, each crew member was designed as a 2D vector illustration, with anchor points at each joint and parented together to create a moveable figure within a 2D/3D environment. 3D camera movements, particle animation, and additional 2D compositing effects provided further cinematic elements to enhance the overall impact of the intro. Foley sound effects were included to add an extra layer of realism to the animated segment. With these exciting new title sequences, The Dog Dish aims for a spectacular second year of production at Northern Lehigh High School. Keep checking the site for news and updates from the NL Studios crew! Click here to view The Dog Dish Season 2 Standard Intro. Click here to view The Dog Dish Season 2 Halloween Intro. Click here to view The Dog Dish Season 2 Holiday Intro.